Reminiscent of a ball dropped into a domino ball track; an opportunity that comes in, trickles down to the last possible grabber. When companies, driven by factors like cost and nature-of-work found exciting opportunities in India and other Asian countries, it marked the beginning of a global workforce utilization and BPO growth in India. But the domino effect of businesses, progressively looking to reach out to the next cheapest grabber is now firmly knocking at the doors of rural India encompassing Tier 2 and 3 cities, towns and villages, indicating the rise of rural BPOs in India. What Triggered the Rise of Rural BPOs in India? Though achieving extreme cost benefits has been the underlying force driving businesses to set up BPOs in rural India, there are other crucial factors which have augmented this BPO trend. When tier 1 cities started servicing more knowledge intensive jobs like Knowledge Process Outsourcing and Legal Process Outsourcing among others, non-core tasks like Data Entry and Automated Data Processing Services became non-challenging and non-competitive to the highly qualified resources in these cities. This also triggered the slow and steady movement of these kinds of jobs to tier-2 and tier-3 cities, towns, and villages, indicating a changing scenario for the BPO sector in India. Certain jobs like Native Language Transcription or conversion, or jobs requiring low or no need of understanding English language, basic skills involving monotonous or little usage of software and computer skills etc., all became the ball bearings for inducing the rural outsourcing and rural IT BPO industry in India. With India vying for major software contracts and its emergence as world's leading software service provider; the cost of living, infrastructure, medical care, etc., has seen a sharp rise in the cities, invariably affecting the cost of BPO services in India, which has sort of reached a tipping point now. This also made businesses to set up rural BPO centers which are extremely cheaper. Some villages in India are still awaiting power connections, and others who have experienced the light bulb but are still marred with long power cuts and poor quality electrical connections. Internet connections are of course a rarity and for villages who do browse the Internet run on extremely low speeds making the whole experience annoying. Poor educational infrastructure in villages and rural areas forces locals to migrate towards greener pastures for quality education, and they usually don't return. So, chances are that you have to tackle group of poorly qualified resources to get your work done. As the education levels are low you have to spend much time, resources and money in getting them trained and workable. The challenges mentioned above are surmountable, and can be carefully and effectively addressed to make greater inroads. No nation is untouched by the brain drain, and rural areas in India are no different. However, reverse brain drain is a possibility as most people are willing to return back if given job opportunity in their own area. When put into practice, this method may address the problem of unskilled workforce effectively. Secondly, 'Rise of BPO in India' is finding its true meaning with many rural BPO outreach initiatives explored by innovative businesses like the Source for Change - an initiative of the Mumbai-based Piramal Foundation. The good news is that around 100 such organizations are likely operating around India. So, the future of rural BPO in India shows promise and shall clearly encompass viable rural areas. If you have any queries on outsourcing call center services to India or regarding BPOs or KPOs, get in touch with representatives from Outsource2india now! 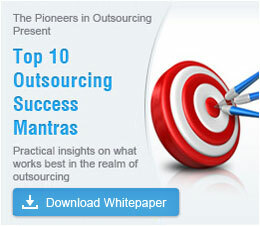 Innovative new services that are being provided by outsourcing vendors. Interesting facts about the Indian BPO industry.